Before I dive into a description of our most recent hike I wanted to mention that last night we had a chance to listen to a presentation by William L. Sullivan, the author of the hiking books we use to plan our hikes. He presented a number of new hikes that are included in his updated guide to the Central Oregon Cascades. He travels around Oregon giving presentations throughout the year and you can check his calendar of events at http://www.oregonhiking.com/ if you are interested in attending one. Now on to our hike. We traveled to Tillamook on the Oregon Coast for a hike around Bayocean Spit which protects Tillamook Bay. I’d picked this hike due to the lack of elevation gain given both Heather and I have races in two weeks (a full marathon for her and a half for me). This turned out to be another interesting hike with the Pacific Ocean on one side and the bay on the other. Between the two the spit is a mix of grassy dunes and a small forest. We decided on hiking in a figure 8 pattern in order to cover both sides of the spit as well as explore the forest via a .5mile connector trail. We left the parking area and headed West across some grassy dunes toward the beach sporting some less than attractive ponchos. It was a cloudy day with intermittent rain. 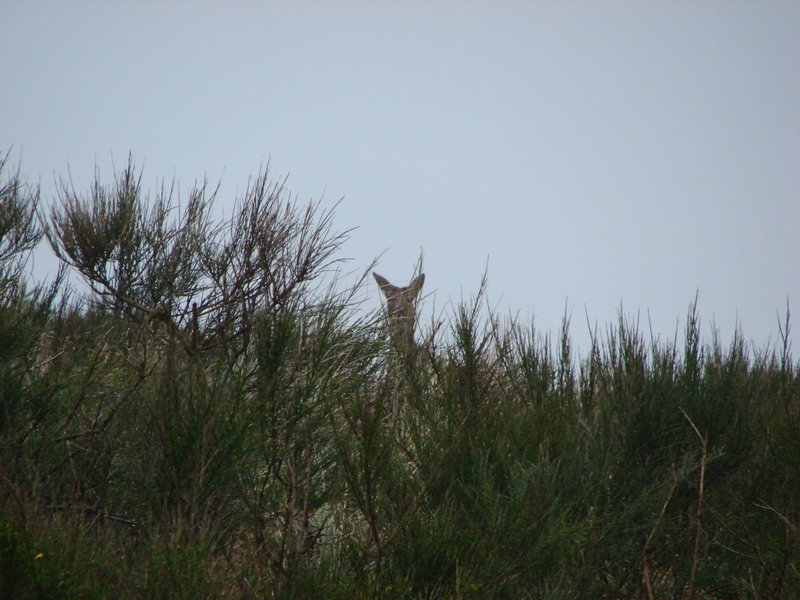 We must have been a sight because it wasn’t long before we noticed a doe watching us from behind a dune. We found the beach which was empty aside from a few seagulls and turned north. There were numerous shells and sand dollars in the sand. To the south was Cape Meares along with Pillar & Pyramid rocks, and to the north was Cape Falcon. As we approached the forested section of the spit we quickly spotted several Bald Eagles perched in the tree tops. We also noticed a large gathering of seagulls on the beach. Curious about the attraction Dominique and I set off for a closer look while Heather searched for the connector trail to the bay side. 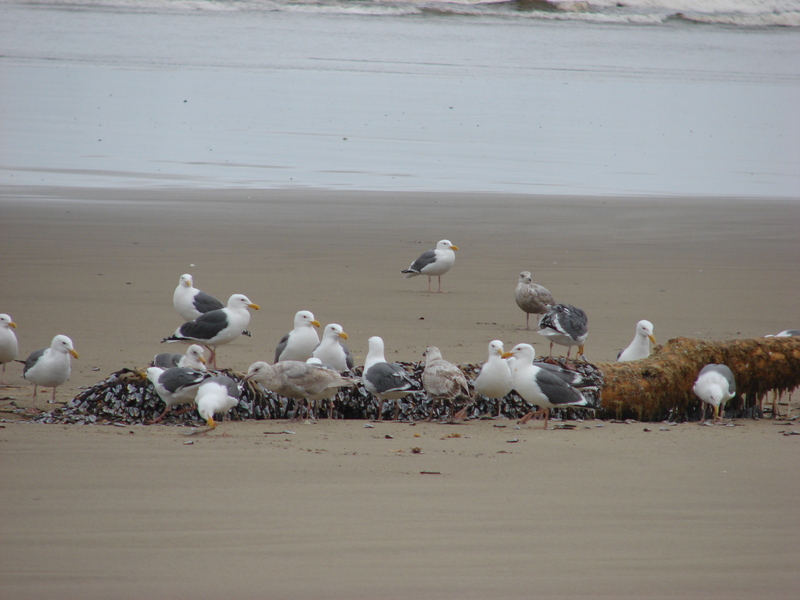 As we got closer to the birds we noticed that they were huddled around the end of a log that had washed up on the beach. 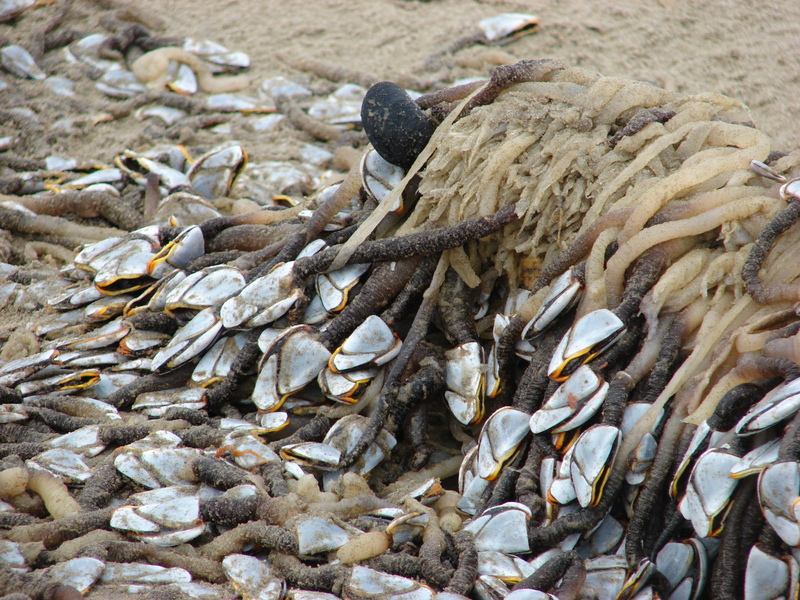 That end of the log appeared to be covered with some type of clam. After satisfying our curiosity we headed back to the now located connector trail. This sandy half mile trail led through a small but varied forest to an old dike road along Tillamook Bay. The water level was low due to it being a low tide and the number of birds was less than we had hoped, but we did spot a Great Blue Heron, several ducks, Canadian Geese, and another Bald Eagle. We continued north along the road to an abandoned campground across the bay from the city of Garibaldi. Shortly after the campground we spotted some flagging leading back across the spit toward the ocean. and the took the connector trail back through the forest to the road. This time we turned right (south) and headed back toward the parking area. It wasn’t until this last leg that we saw any other people which made for a very peaceful day. We hope everyone had a happy Easter weekend. After attending a Saturday worship service we took advantage of some great weather and headed South to Fall Creek. 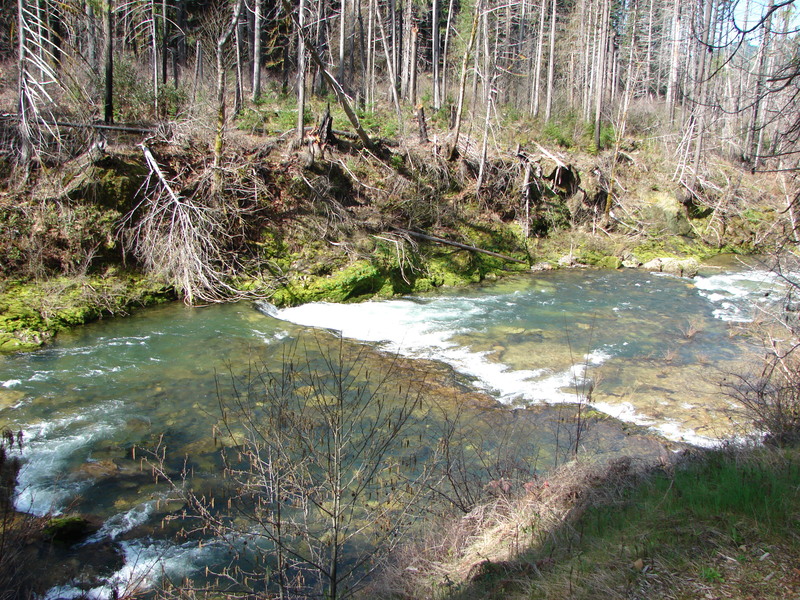 This was our second hike in a row along a creek in the Willamette National Forest East of Eugene. The forecast had been for a few showers throughout the day but lucky for us the weatherman was way off. Temps were in the low 50’s when we set off and it wound up being a warm and sunny day. The trail sets off on the Southern bank of Fall Creek through an old growth forest. The first few miles follow Fall Creek through this damp and mossy forest crossing several scenic side creeks on footbridges. This portion of the trail was fairly muddy in spots. Fall Creek was much larger than Larison Creek (our previous hike) with many deeper pools, and the clear water made for some great views. Our timing was good as many of the spring flowers were in bloom carpeting in the forest floor in yellow, purple, and white. 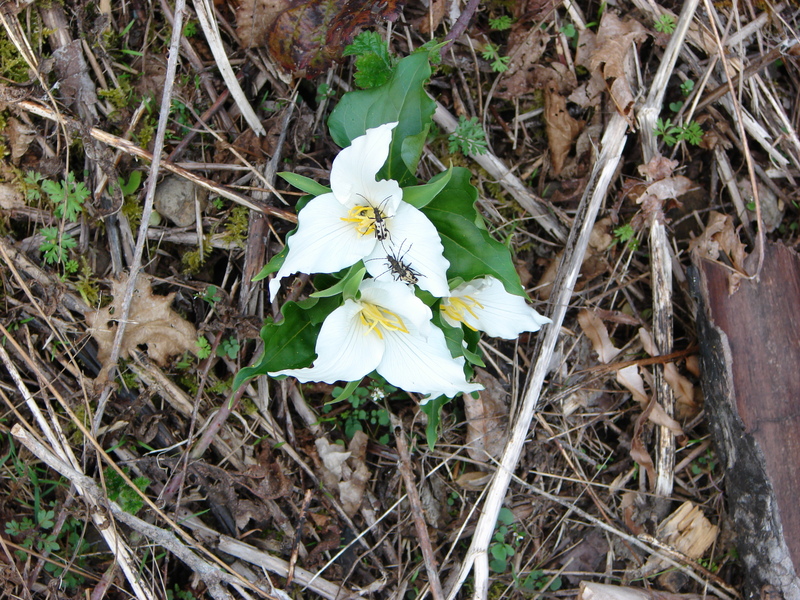 The Trillium blooms were particularly pretty. After 3.5 miles the old growth gives way to a section of forest that was burned in 2003. This burnt section housed many different wildflowers that prefer the direct sunlight afforded by the fire. It wasn’t long before that direct sunlight had us needing to remove some clothing layers. After a brief pit stop we were off again, now on the Northern side of the creek after crossing on a bridge. Our goal had been Slick Creek Cave but we decided to continue another half a mile to Bedrock Campground just in case anyone wanted to use the facilities. When we first crossed Slick Creek we completely missed the side trail up to the cave despite my taking several pictures of the cliffs that housed it. When we reached the trail fork for the campground loop we realized we had missed it. The creek bed near the campground was very colorful and worth the extra distance. 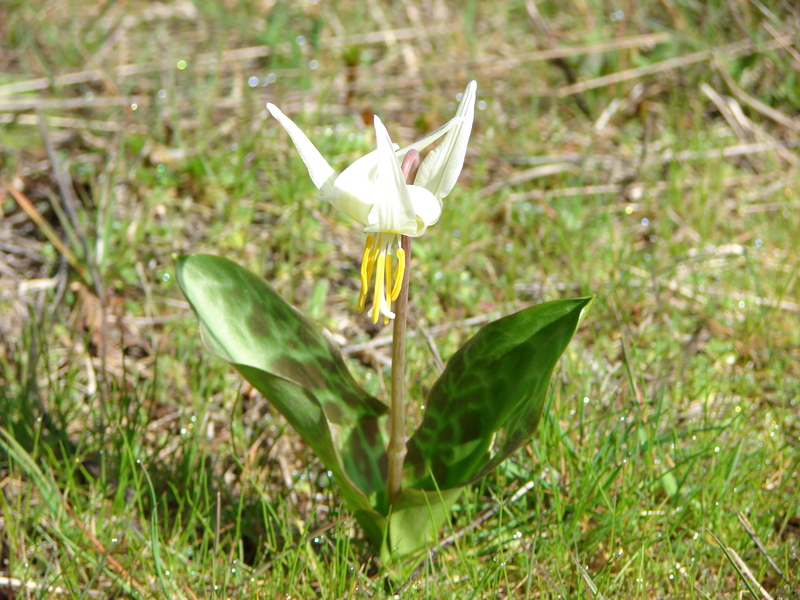 We also came across a type of lily that we had not encountered before. When we reached Slick Creek on our way back the side trail had magically appeared. We took the short obvious (this time) trail up to the cave which is basically a recess in the cliff. Apparently it was used by Native Americans for shelter at one point and made for a nice side trip. Overall this turned out to be a really nice hike. In addition to the various wildflowers we saw a decent amount of wildlife. In the old growth section we came across several snails, slugs, birds, and a Rough Skinned Newt. The burnt section offered geese, ducks, an osprey, several lizards, and a snake. Although this is a heavy use trail we only ran into a handful of people on the trail on this day. Due to the various campgrounds along Big Fall Creek Road which follows the creek on the opposite side there was some car traffic and a number of campers across the water.